+Paul Wolfe over at Mystic Bull games has been putting out some great stuff for White Star lately. 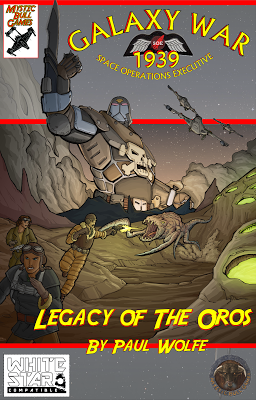 I recently picked up "Legacy of Oros", the first full length adventure set in Paul's Galaxy War 1939 setting. The setting pushes all the right buttons for me. I love retro-sci. One of my favorite graphic novels is Ignition City by Warren Ellis and I love the old Dan Dare comics. British and Nazi rocket-ships dog-fighting over Mars really fires up the imagination. In the adventure the PCs travel to a former British colony world now under control of the Reich. There they must rescue a scientist trapped on the planet. The adventure is cool, for though all the great source material in the book is the real treasure. There are stats for tons of new alien creatures, Nazi spacecraft and tanks, and a spaceship for the players to use. There's even details on some new psychic abilities. The art in this book is fantastic. The images of the Nazi stormtroopers or Raketekommandos and the WW II era spacecraft capture the retro sci-fi feel perfectly. There's even a short multi-panel comic that I'm dying to read the rest of. If you like retro sci-fi, I highly recommend this adventure. Make sure to checkout some of the other products for Galaxy War as well. One Page Adventures - Bug Hunt and Last Transmission. 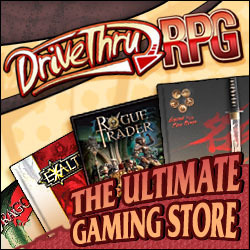 Channel Zero - A Blog About Role Playing Games. Picture Window theme. Powered by Blogger.